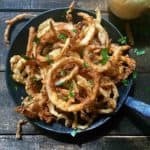 Easy Southern Style Crispy Onion Rings are light, crunchy and delicious fried onion rings with a Southern spin. 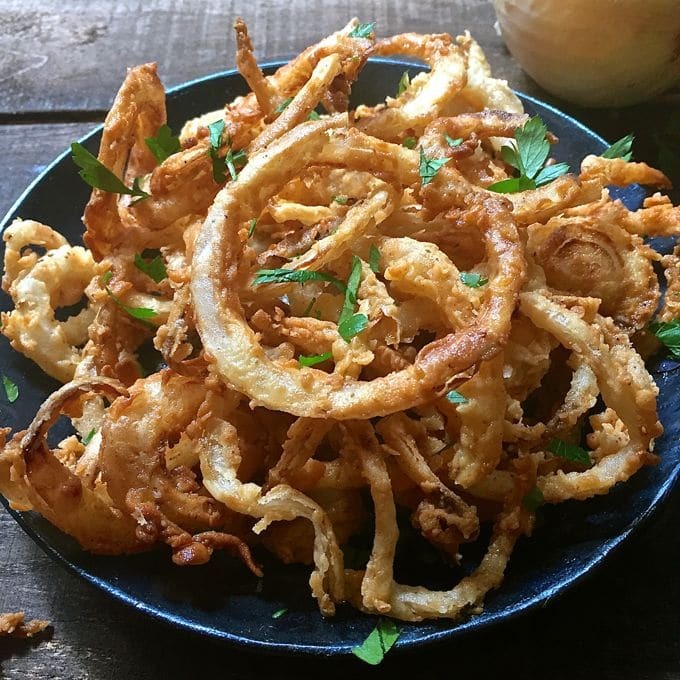 Thinly sliced and more like onion straws or onion strings, Southern Style Crispy Onion Rings are delectable cruciferous vegetables bathed in buttermilk, coated with a light dusting of flour and quick fried, which makes them extra crispy, and extremely flavorful! And, no matter how much you are planning to make, do me a favor and double it! You will thank me later. I can promise you that these onion rings will disappear right before your eyes and well, there is no telling how many you will have to taste, just to make sure they are perfect! I mean, you wouldn’t want to serve anything to your family that hasn’t been taste-tested first. Right? 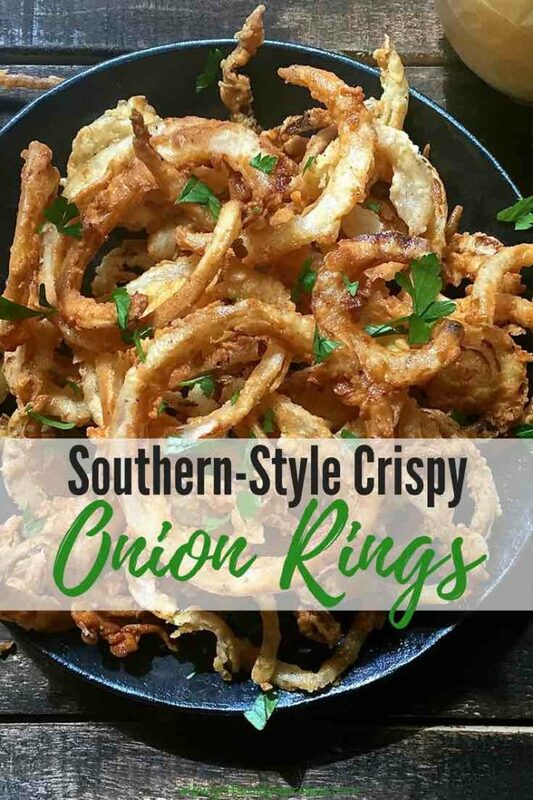 Southern Style Crispy Onion Rings can be served as a scrumptious snack, or yummy side dish for just about any meal, but they are also a perfect topping for your burgers. Check out my Ultimate Southern Burger post where I will show you just how these delicious morsels can transform even an ordinary hamburger into one that deserves a place in the Southern Food Hall of Fame. 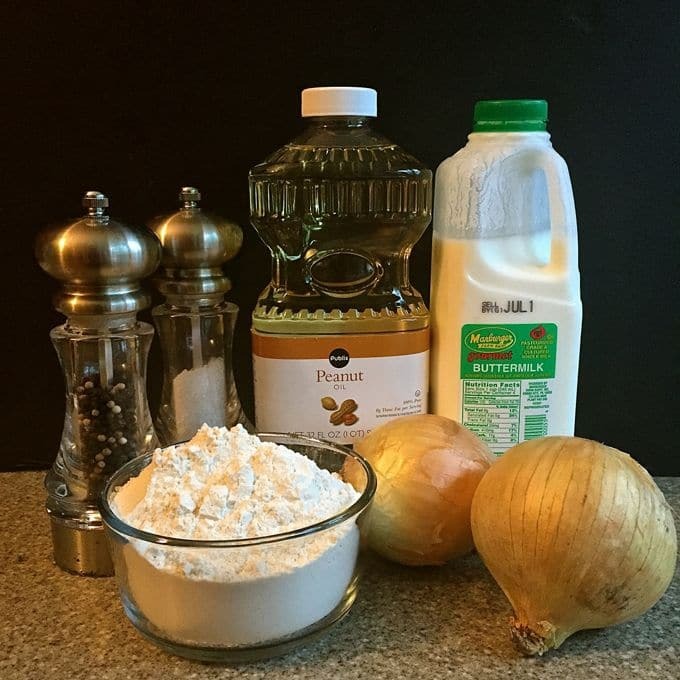 Southern Style Sweet Onion Casserole. 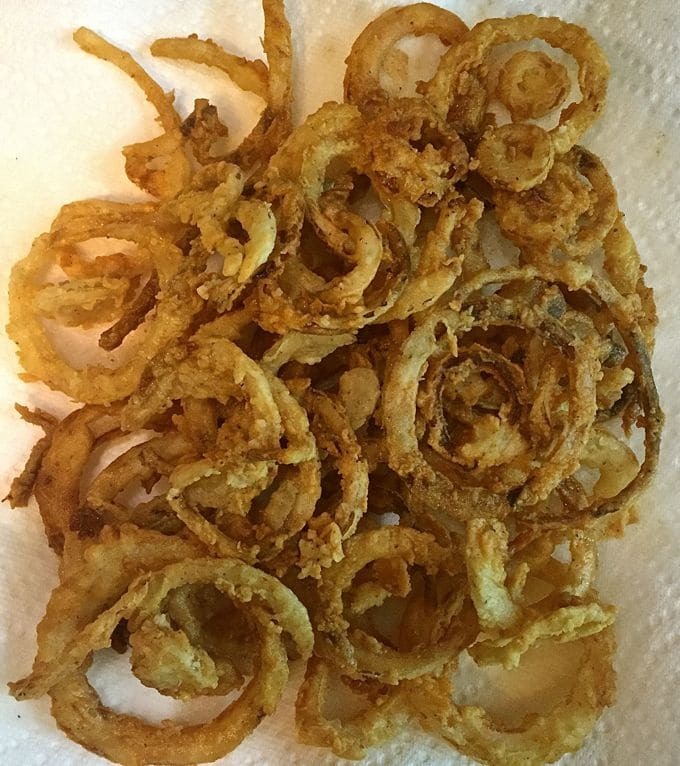 You may be wondering about the gorgeous hand-forged frying pan that my Southern Style Crispy Onion Rings are cradled in? When my husband and I were last in Cashiers, NC we went to an arts and craft show where I saw these beautiful hand-made frying pans. I knew immediately I had to have one and, as you can see, the rest is history. This beautiful pan was made by Matthew Shirey of Shira Forge in Sylva, NC. In addition to this unique frying pan, he also sells hand-forged knives and other kitchenware, and you can find more of his one-of-a-kind hand-crafted work on Etsy. 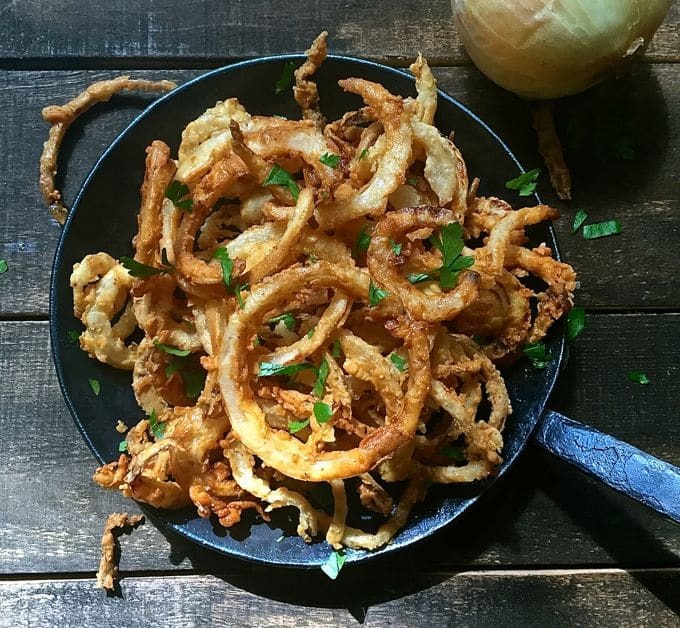 The ingredients for Southern Style Crispy Onion Rings are simple: sweet onions (preferably Vidalia onions), all-purpose flour, ground red pepper, kosher salt, peanut oil or another vegetable oil, and buttermilk. That’s it! 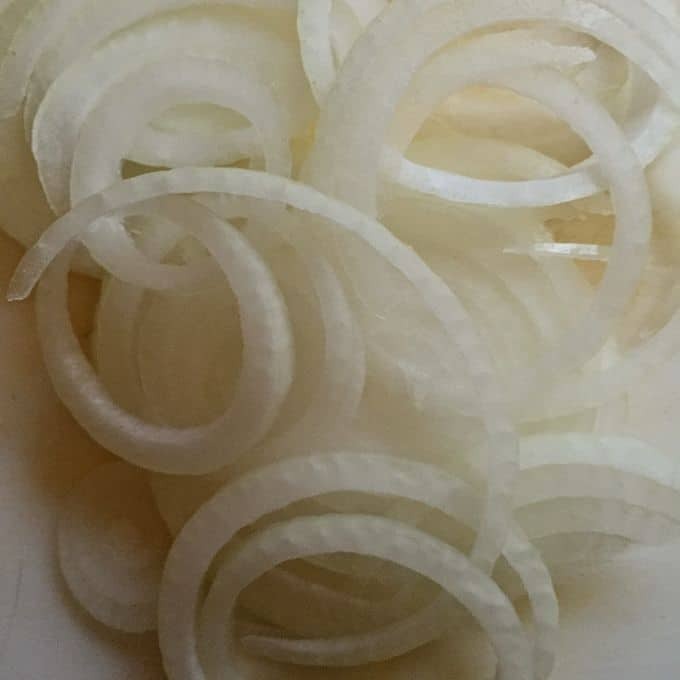 To make Southern Style Crispy Onion Rings first peel and slice the onions as thin as possible. Separate the rings. 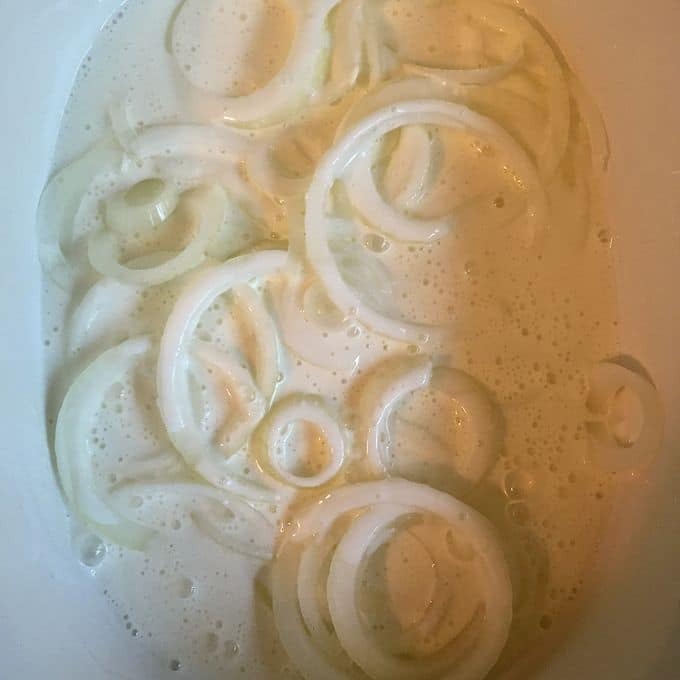 Place the onion rings in a shallow bowl and cover with buttermilk. Allow the onions to soak in the buttermilk for at least an hour. Combine the flour, salt and red pepper in a shallow bowl. Preheat the oil in a dutch oven or large frying pan over medium-high heat to 360 degrees F.
When the oil is hot, take a handful of the onion rings and dredge them in the flour mixture. Shake off any excess flour and add to the hot oil. Use a fork to separate the rings, so they don’t clump together. Fry for 1-2 minutes or until they are golden brown. Watch the onion rings carefully; they can go from perfect to burned in a matter of seconds. Repeat as needed until all of the onion rings are cooked. Drain on paper towels. If you need to keep the onion rings warm, preheat your oven to 225 degrees and put them on an oven proof plate for up to 30 minutes or until you are ready to serve them. Want more? check out all of my Southern-inspired recipes HERE! 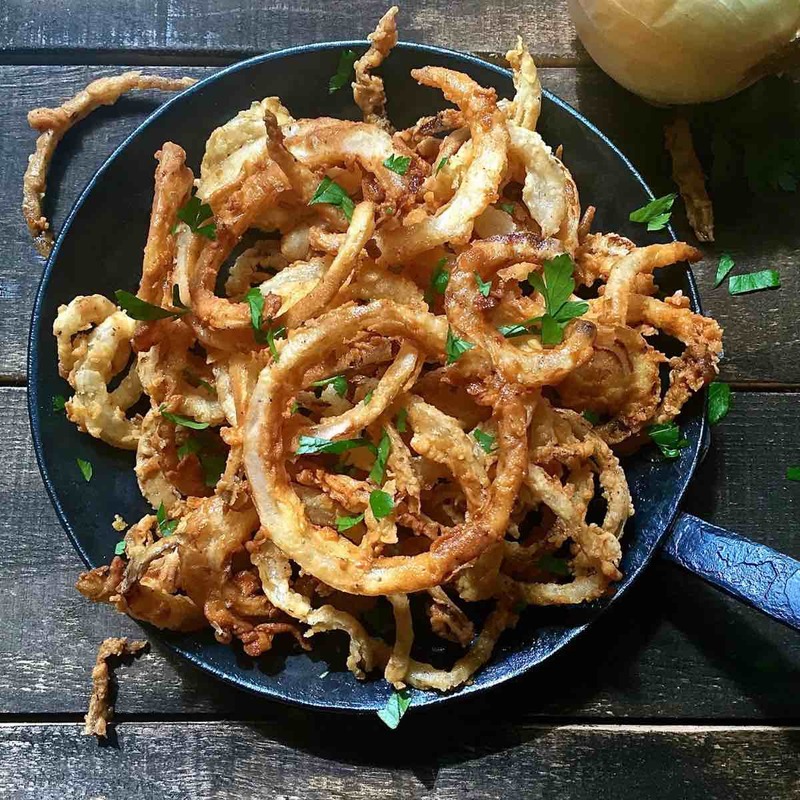 Thinly sliced and more like onion straws or onion strings, easy Southern Style Crispy Onion Rings are extra crispy and extremely flavorful delectable morsels! Peel and slice the onions as thin as possible. Separate the rings. 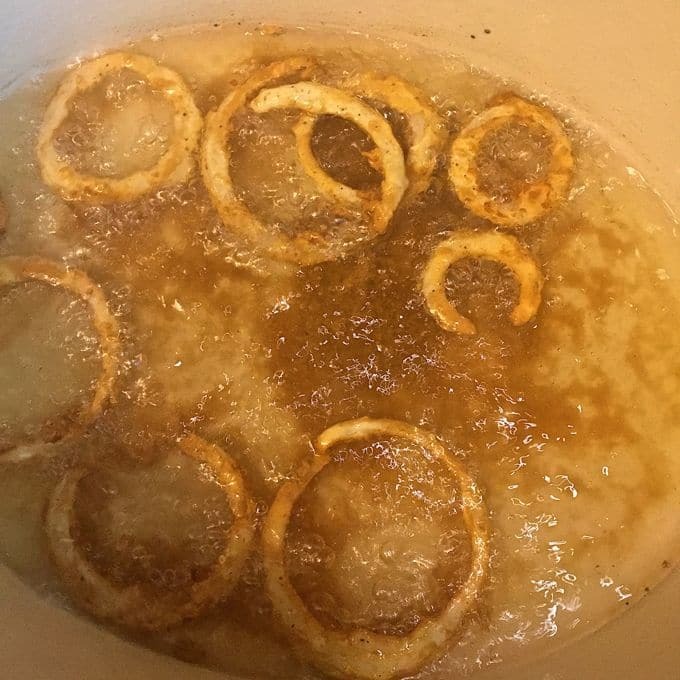 Preheat the oil in a dutch oven or large frying pan to 360 degrees F.
When the oil is hot, take a handful of the onion rings and dredge them in the flour mixture. Shake off any excess flour and add to the hot oil. Fry for 1-2 minutes or until they are golden brown. Watch the onion rings carefully, they can go from perfect to burned in a matter of seconds. Repeat as needed until all of the onion rings are cooked. Drain on paper towels. Mmmm…onion rings! So yummy and so easy! Love that pan! Hi Melissa, thank you! Yes, they are really yummy! I love the pan too and actually just bought it at an arts and crafts show. It’s hand-forged and if you are interested, you can buy one on Etsy. It was made by Matthew Shirey at Shira Forge. These look awesome! Hard to get in New Jersey. Our favorite old fashioned drive-in recently closed and this looks like their onion rings. I’m going to try it out. Hi Mary Ann, thank you for your nice comment! They are really good and very addictive! If you make them let me know how you like them! I just made these yesterday for dinner. They turned out delicious! Everyone loved them and it seems it IS the same recipe as our beloved restaurant that is now closed. Thanks so much for sharing Mary Ann! I’m so glad you and your family enjoyed them! OMG – these look incredible! Thanks Chula! They are really, really good! I had a hard time not eating all of them!